Also in Briefly in Tompkins, the Red Cross will hold lifeguard training at Dryden High School, running from noon to 8:00pm every Saturday in October. In a piece on what to call people from various areas, Carol Kammen notes the acceptance of "Drydenites". Hank Dullea's guest column on contested races notes the contested Dryden race this fall. If you're reading this as I write it, you're in time to get to the 7:00pm candidates forum at the Etna Fire Station, 26 Wood Road, which the Journal listed in this morning's Briefly in Tompkins. The Journal seems to have reprinted the Republicans' self-serving press release verbatim, conveniently glossing over that the Democrats had reserved the Varna Community Center for October 23rd, a more traditional time for these conversations, and were planning on another event in the Village of Dryden before the Republicans decided to hold a very early one there. The Journal also publishes political commentary where it belongs, on the opinion page, printing Steve Adams' detailed letter on the earlier forum and my letter endorsing the Democratic candidates. In non-political news, you don't have to stay in Dryden to do good things for the world. The Journal reports on Joey Motsay's raising $35,000 for Friends for an Early Breast Cancer Test by pedaling a stationary bike for 174 hours in Greensboro, North Carolina. At the county level, there's a report on the county budget forum and one on the 211 information line. This morning's Journal reports that the County Legislature voted to apply for a grant to support a farm preservation grant at the Lew-Lin farm in Dryden. If the state grant is awarded, the Town of Dryden will purchase the development rights. Next door to Dryden, more people are flying out of the airport and fares dropped. Want to write a letter to the editor on this year's local election? Today's editorial lays out the rules. Trolley bells can be annoying, but after a while you don't hear them. It's convenient to have one right in front of my house, though, since the trolley lines and the bike paths next to them are the only reliable transportation we have left. When I walk down to the trolley, I can get to Ithaca or Freeville without changing trains, and Groton, Dryden, and Cortland are an easy connection away. There's no real express service until you get to Cortland, but once you're there, Syracuse and Binghamton are just a ride away. My favorite part of watching the trolleys is actually the freight they carry: special cars for concrete from Saunders and gravel from various places around here. Boxcars and the occasional refrigerated car carry food down to Ithaca and come back empty. I'm lucky to have two hamlets within biking or even walking distance. Varna has a pharmacy and dry goods, while the greenhouse zone to my east has produce year-round. If I go up to Freeville, I can get barrels of grain, which fit neatly onto the trolley's cargo system. My own garden helps, of course, but it's convenient to get the help. It's getting toward sunset now - time to get ready for bed! Not what you expected from Living in Dryden? That's okay. It's really a piece for a new project I've been writing, Upstate 2050. Conversations about Upstate's future seem permanently stuck on a variety of blame games - taxes, corporations, New York City, the federal government, Albany, and the other usual suspects. I'd like to step beyond the usual back and forth, and see if we can develop some visions that can change that conversation. I definitely don't mean "visions" as "happy positive futures we'll all strive for" - those visions seem popular with planners who are selling projects, but they're only one small piece of a larger possible set of options. I'd like Upstate to think about the possibilities it has as a way of examining what we have and what we have to face. 2050 seems just far enough away for that kind of thought process. It's not so far ahead that we'll likely lurch into science fiction, but it is far enough ahead to think about what kinds of large-scale change might happen. If you have ideas for either Dryden 2050 or Upstate 2050, let me know! There is no reason to be a downer in these times. The large ideological crevasse between those here in America who see themselves as "haves" and those who are "have nots" is narrowing. About 34 percent of those surveyed place themselves firmly on the "have not" side - up from 17 percent nine years ago. And over on the "haves" side, the number of people feeling pretty good about life has dropped from 59 percent in 1988 to 45 percent today. Ah, to be young - those in the 18- to 29-year-old age group were more likely to be optimistic. And women are pretty hard on themselves, with 37 percent considering themselves to be a "have not". That's in comparison to men, weighing in on the "have not" category at 30 percent. Want to make yourself feel better? Buy some stuff. We've got lots here to choose from. They dangle the idea that the 18-29 age group feels brighter, but offer no data on how much. But hey, it's not like gender could have any possible effect on what a person's material well-being, which usually contributes to the whole "haves" and "have nots" thing. It's just that "women are pretty hard on themselves." Right. And then the final joke: the answer to making yourself feel better, presumably to feel like a "have", is to "buy some stuff". Never mind if you can, say, afford it, or if you need it. Maybe there's something worthwhile in the underlying study, but this is laughable. Does anyone read this stuff before they print it? Update: I guess I'm not the only one asking. I finally got to sit down and read the Route 13/366 Corridor Management Plan last night. After disliking the initial visions presented, wondering if and when the report would ever appear, and then finding the opening of the plan discouraging, it took some energy to take a close look at it. Contact NYSEG to explore the viability of removing, minimizing, or screening the power lines and substation in the overlap section of Route 13 and Route 366. This area is important for the nodal development pattern and anything that can be done to improve the viability of the node point should be explored. Coordinate with TCAT on the number of routes and reliability of service in the area. Comments gathered during the study indicated the transit service was not as reliable as desired to use for the daily commute. Work with NYSDOT on a redesign of the western Route 13/366 intersection to improve safety. This should include consideration of the applicability of a roundabout. Travel runs were completed during the AM and PM peak travel hours and non-peak conditions to determine the average speeds along the corridor. Speeds were consistent throughout the day along the entire corridor. Drivers typically traveled at or above the speed limit with a small number of drivers excessively speeding through the corridor. The results of the modeling effort did not show a significant difference in traffic volumes on the corridor during the afternoon peak hour (5 - 6 PM). Each scenario had traffic volumes that were higher in some areas and lower in others, dependent on the projected development surrounding each roadway link. Aggregating the entire Town, however, the ITCTC concluded that the Nodal Development Scenario would result in approximately 3,400 less vehicle miles traveled during the afternoon peak hour than the Existing Development Scenario and approximately 34,000 less vehicle miles traveled for an entire day. The main difference between the two scenarios is that the "existing scenario" would have these lights installed in a reactive way, and that there might be roundabouts at the entrances to the Village of Dryden in their preferred scenario. Possibly fewer additional turn lanes needed in the nodal scenario. this report recommends the elimination the passing zone on Route 366 though the hamlet. A passing zone does not promote safe, controlled speeds though the hamlet and the sense of place desired by the community. In addition to the elimination of the passing zone to improve safety, the community should seek a speed limit reduction on the roadway and the installation of traffic calming measures. Street furniture and trees, as well as gateway features such as roundabouts will improve safety by heightening drivers' awareness of the hamlet. These measures will further enhance the viability of Varna as a node and improve the safety for drivers and pedestrians. Finally, sidewalks should be constructed throughout the hamlet to ensure the safety of pedestrians. Currently, the lack of sidewalks requires pedestrians to share the roadway in a high speed passing zone. As redevelopment occurs, sidewalks should be required along with high visibility crosswalks. Nodes should have support for bicycles and pedestrians. School buses could use those nicer stops or similar stops. Emergency vehicles might have an easier time in traffic. If you'd like to see what the nodes they propose look like, you can download the drawings (4.5MB PDF). I can't figure out why exactly people will want to live behind the Xtra Mart on 13/366, but maybe an Ecovillage could go there? The next 12 pages are proposed zoning language designed to build these nodes. The county, of course, has no zoning authority, but apparently they hope to influence the upcoming zoning process. I'll have to get a copy of the letter, but it sounds like the Dryden Planning Board has already told the county to go away. At the very end of the document, they finally think about resident concerns again and claim this will address them. There are also appendices, one on the community forum, another on NYSDOT Accident Reduction Factors - which I don't see used anywhere else in the document. I'll write a concluding piece on this later - this is already way too long. Former County Legislator Mike Lane is asking hard questions about the county's sales tax on clothing and shoes. Cortland has removed the tax on items below $110. On the opinion page, Harvey Baker of Dryden writes about the defacement of the Vietnam Wall in Ithaca last month. 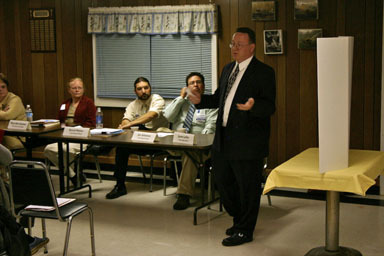 It's continuing to be a good year for candidates forums, with about 25 people attending Tuesday night's event in Etna. We got off to a bit of a late start, because the Republicans needed to get their projector for the presentation they open with, but once it started, the conversation flowed. 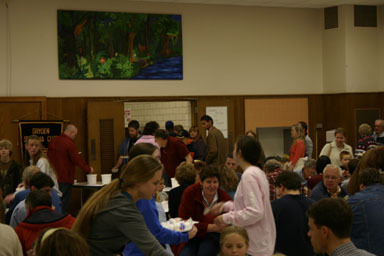 Crowd at Etna meet the candidates forum. This forum, moderated by WHCU's Geoff Dunn, felt a bit calmer. More of this forum focused on issues specific to the town, with questions of patriotism trapped in a multi-part question from Henry Kramer that even the Republicans didn't seem to give the yes or no he'd requested. Mike Lane's final question, on sewers, struck me as closest to the kinds of concrete issues the Town Board will have to deal with. 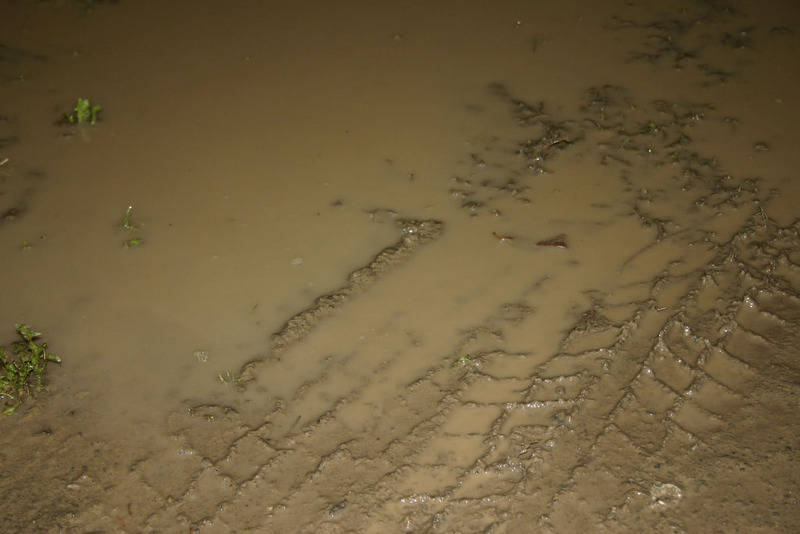 The Republican Town Boards seemed behind on sewers (though to be fair, Town Clerk Bambi Hollenbeck had some good ideas about grants) and the Town's Comprehensive Plan. On the Republican side, only Stan Marcus seemed familiar with it, while on the Democratic side, only Joe Solomon hadn't read it deeply yet. The Justice candidates had fewer questions until near the end, when someone asked about Drug Court. Republican Judge Chris Clauson said he couldn't discuss the matter, while Democratic challenger Jason Leifer made it plain that he wants all sentencing options available. Town Justice candidate Jason Leifer gives his opening statement. Eminent domain also came up, with Art Berkey asking about its use for private developments, the kind of issue that raised a fury in the Supreme Court's Kelo decision. Everyone seemed opposed to the use of eminent domain for those purposes, and Democratic Supervisor candidate Mary Ann Sumner said further that the use of eminent domain needs to be for large public projects, not simply recreation or trails. The next (and currently last) candidates forum will be at the Varna Community Center, October 23rd at 7:00pm. As always, refreshments will be served, including my mulled cider. After three years of being the Chair of the Dryden Democratic Committee, I should probably be cynical enough about Republicans to ignore the mud they throw about candidates, about patriotism, and about the way elections are conducted. Today's guest column by Jim Crawford, Town of Dryden Republican Committee Chair, still strikes me as genuinely strange. Jim spends a lot of effort talking about how much nicer politics really should be, but the reality seems to be that he wants it made nicer for him and his candidates. It's a brilliantly written wolf-in-sheep's-clothing piece, carefully avoiding making any suggestions to change the election laws while claiming that Democrats should be nicer. If I didn't know anything more about the issues, I might even believe it. While the piece might seem on the surface to be about the freedom of amateurs to put candidates on the ballot, it's really a complaint about friction between well-organized professionals. Crawford doesn't attempt, for instance, to complain about the removal of the "Anti-Death Party"'s candidate for Mayor of Ithaca because of large problems with the petition. He just wants the pieces that bother him to be eased. Democratic candidates didn't file petitions for an independent line in Dryden because, frankly speaking, it's a good year to be a Democrat. Last year was a tremendously good year to be a Democrat. The Republicans, on the other hand, seem to be running from their party identification any way they can. Calling their independent line "All the People" doesn't make it true. His complaint about Martha Robertson's challenge, trying to carry his complaints from the Town of Ithaca and into Dryden, where he's running the Republican campaign, is self-serving at best. Yes, Robertson filed an initial notice that she might be filing a complaint. However, when she concluded that there were no grounds for a complaint, she (wisely) didn't pursue them. Any citizen can do this, so long as they rush down to the Board of Elections during the three-day window for filing a preliminary challenge. I don't find anything deeply wrong about it - at worst in this case, it's helping to ensure that an organized group of people who do know the rules pay close attention to the law. Most fundamentally, though, Crawford complains loudly about election law, but doesn't propose changing it, simplifying the process of getting on the ballot. Republican Governor Pataki and the still-Republican State Senate weren't interested in such ideas in 2001, and Republicans likely see them as an even greater threat to their remaining control of the State Senate today. He just wants Democrats to be nicer, without changing any of the foundations that help keep his party in power. 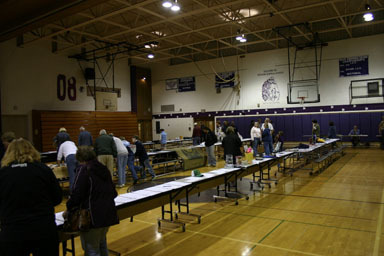 In some ways, this is a great year for Dryden elections. Voters have lots of choices to make, and I think the parties are more evenly matched for organization and registration than ever before. Unfortunately, the Republicans seem to be taking a competitive race as reason to muddy the waters in Dryden - by adoptiing the kinds of tactics they've used successfully elsewhere. It was a similarly shameless mix of wrongfully challenging Democrats' patriotism while complaining about technicalities - except for the ones that benefited them. Politics doesn't have to be this dirty - but as long as it is, we shouldn't pretend otherwise. I also forgot to note something in yesterday's Journal, from former Republican County Legislative candidate W. David Restey calling for a vote on having a county executive. Update: And apparently I got so caught up in what I'd missed from the Friday Journal that I missed something new in the Saturday Journal, a letter from Town Board candidate Stanley Marcus on continuing efforts to fend off invasive insect species. Orchid, still flowering after a year. The instructions for orchid care were very simple: Put on a nice, sunny window and once a week hold the pot under the faucet for watering. I always knew orchid flowers last a long time. 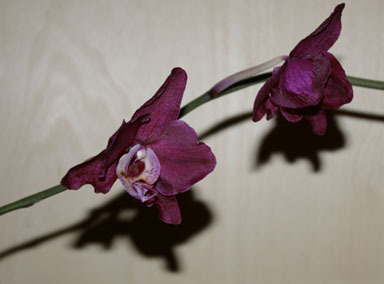 I never expected my beautiful new orchid would keep flowering throughout the entire year, from birthday to birthday. And it is just putting up a new flowering shoot. On the front page, the Journal looks at Cornell's plans to invest $20 million in the community over the next ten years. A sheriff's car, a few state police vehicles, some police motorcycles, and some SUVs including a black stretch SUV just went down Route 366, sirens wailing. Anyone know what's up? I don't see much on the Governor's press releases and don't know who else gets such loud transportation. Yesterday's weather led to a crash in Freeville, between a garbage truck and a tractor-trailer. In good news for the county, Borg-Warner will move 174 jobs to Lansing from Oklahoma, and perhaps that will bring some new people to Dryden homes as well. Most of the rest of the Dryden news in today's paper is on the opinion page. Nancy Suci writes to support the Democratic candidates and remind readers of where the western Dryden boundary is. Martin Hatch of Dryden writes about planning in Dryden, and also supports the Democratic candidates for Town Supervisor and Town Board. County Democratic Committee Chair Irene Stein responds to an earlier guest column by Dryden Republican Committee Chair Jim Crawford on petition challenges. I replied to Crawford's position here earlier, though in some ways that reply is also a reply to Irene. The more I think about it, the more I think New York State needs to tear down its rules for getting candidates on to ballots and start over. I don't think either the Democratic or Republican party would like to do that, but it might both end a pointless debate and put some needed excitement back into state and local politics. Today, October 12th, is the last day to register to vote for the November 6th election. 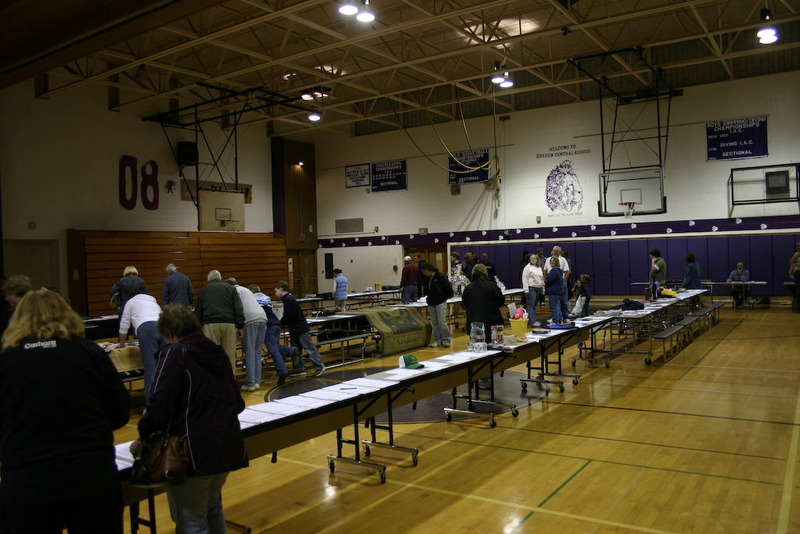 For more information, visit the Board of Elections - they're open until 4:30pm today. I was happy to find a parking space and a seat at last night's Sertoma Spaghetti dinner, which always feels like one of the busiest events of the year. The spaghetti, meatballs, salad, and garlic bread helped support Sertoma Soccer, while in the gym a silent auction was supporting the Dryden senior class. My house had a questionable roof when I bought it in 1999. It didn't seem to leak, but it didn't look likely to last, either. The old roof, looking less than perfect. I've thought about replacing it for years, and even had some estimates done, but I didn't get around to actually having it replaced until now. 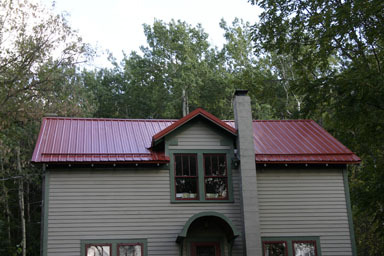 After years of thinking that I'd go with asphalt architectural shingles, I changed my mind and went with metal. I hadn't even liked metal at the time I bought the house, but it's seemed more and more sensible as I've looked deeper into roofing. It lasts, it's much easier to do rainwater collection if I want to, and it's a good surface for mounting solar hot water or solar panels as well. It definitely wouldn't be the only metal roof in the neighborhood. 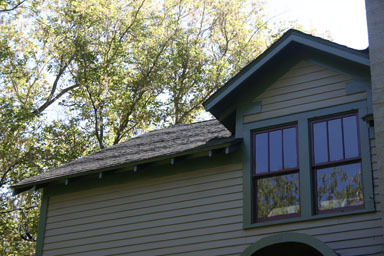 I'd heard good things about Countrywide Metal Roofing, based in Romulus, and their estimate was reasonable as well. (It didn't include gutters, which I'll probably deal with next year.) They dropped the materials for this project off in late September, and called yesterday to find out if it was okay to work here on a Saturday, as they're catching up from a few rainy days. It was fine with me, though I was a little surprised that they wanted to start at 6:30am, in the cold and dark. They got here just around 6:30, and got started. 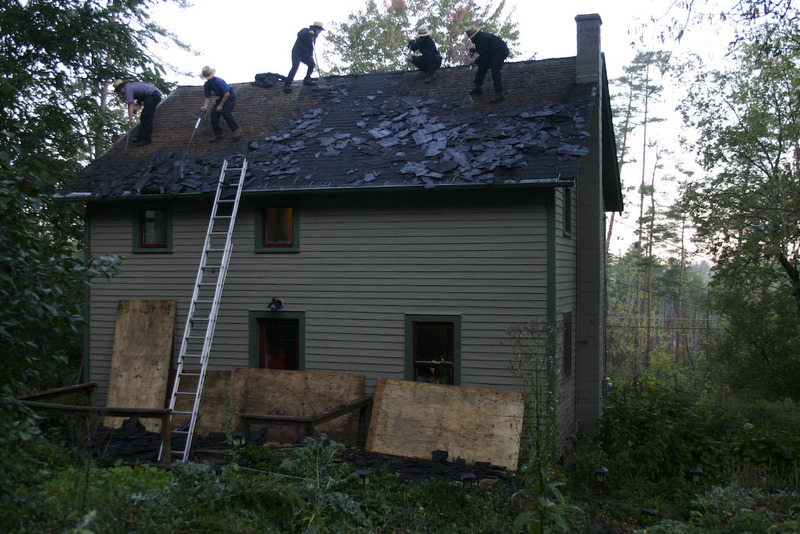 First they had to tear off the old asphalt, leaving the bottom layer of cedar shingles (the original roof) as the bottom from which they'd rebuild. Tearing off two layers of asphalt roofing. 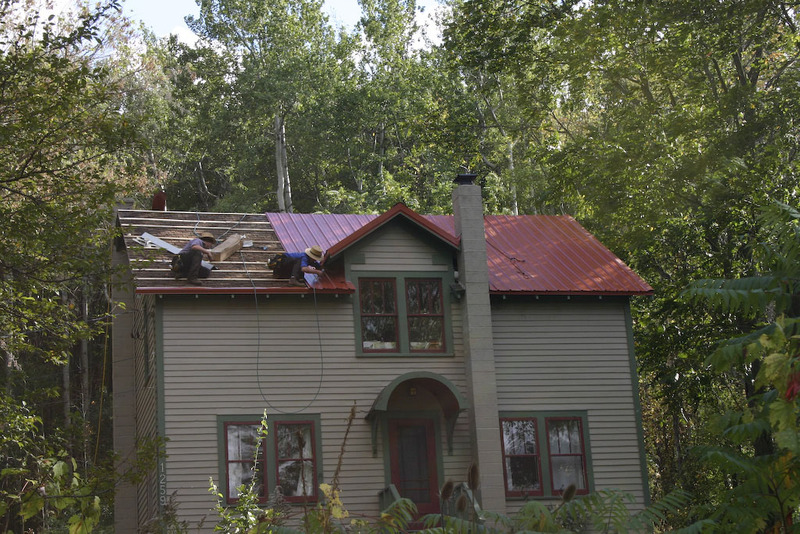 Once the tearing-off was done, the rest of the day was installation of the metal roofing and carting the asphalt shingles to the dumpster they'd had delivered here. 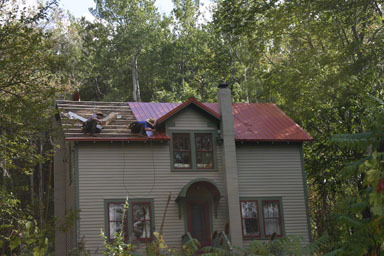 Installing the new metal roof. Want to see more? I've posted a gallery of installation photos. The Dryden Town Board made a substantial contribution to community centers last week, finally distributing $37,750 in funds from the 2006 and 2007 budgets. Some of the 2006 money had already gone to centers piecemeal, but this was the first time that the formal application process really came through to numbers, with grants made toward specific projects. None of the community centers got everything they asked for on the infrastructure and capacity development grants, but all of them got something - including the Dryden Community Cafe, which only came into existence recently. Town Board members David Makar and Steve Stelick oversaw the application process, though it sounded at the meeting like Makar was the one who went through the applications and proposed the distribution. There were also questions about commercial tenants, especially in Varna, where they rent out their kitchen. It seems pretty clear, though, that all of the community centers rely on commercial tenants, from the Post Office in Etna to the childcare in Ellis Hollow (and I think Bethel Grove). Among the projects this money will fund are signs, grills, lights, and hedges for Ellis Hollow Community Center; programming expenses and heating repair at Etna Community Center; building upgrades and programs for youth and adults at Varna Community Center. The board also approved monies for fence repair at Ellis Hollow Community Center; a portion of a freezer that is part of the emergency shelter plan at Varna Community Center; the repair and replacement of the roof at Etna's Houtz Hall, and foundation repair at Bethel Grove Community Center. All of the grants are one-time outlays of existing funds. The board also approved half of the money requested by the Dryden Community Cafe, taking $3019 out of contingency rather than spending funds that had been budgeted with the four existing centers in mind. The new Town Hall will be getting its grand opening ceremony tomorrow, October 18th, from 5:00pm to 7:00pm. Town Board member David Makar reports that there will be cake. It's at 93 East Main Street, Dryden, about half a mile up Route 392 from the four corners in the Village of Dryden. This site's been a bit derelict for the past week, as I was in San Francisco. For work, I was at a conference where every other attendee seemed to be either a venture capitalist or someone with big dreams looking for venture capital. I'm very very glad to be back in Dryden, surrounded by dogs, cats, and chickens. Charles Wilcox of Ithaca wrote to support Stan Marcus for Town Board. Peter Schug of Dryden wrote to support Chris Clauson for Town Justice. Geri Lockwood of Groton wrote to support Cheryl Nelson for Town Supervisor. Christine Becraft of Dryden supports David Makar for Town Board. Greg Potter of Freeville supports Mary Ann Sumner for Town Supervisor. The Journal also had a brief editorial on making local government budgets readable, something Mary Ann Sumner has been working on - see here and here, for example. The last Dryden Candidates Forum will be held tonight at 7:00pm at the Varna Community Center, 943 Dryden Road. All of the candidates from both parties should be there to present their views and take questions from the audience. We'll also have refreshments. On today's Ithaca Journal opinion page, Robin Hadlock Seeley of Dryden writes to endorse Mary Ann Sumner for Town Supervisor and David Makar for Town Board because "they have asked questions, dug into finances and uncovered money that belongs to Dryden but has just sat there, unused". a bridge on a trail at Lime Hollow. She also notes two benefit events coming up. The first, on Halloween, is for the Dryden Community Cafe, and will include a "lock-in" of Dryden's elementary and middle school principals. They'll also have a chicken barbecue at Clark's starting at 3:30pm and an open house at 5:30pm at the former Charlie's Diner, 1 West Main Street on the four corners intersection in Dryden. The second, for Keith and Nancy Yeager, to help them with injuries sustained in an accident on Route 13 in front of their house, wil be from 5:00pm to 10:00pm on November 2nd at the Dryden VFW. Tickets are $25 at the door, $20 in advance. On the opinion page, there are two letters supporting Jason Leifer for Town Justice. Robert Stolp of Ithaca praises Judge Valentinelli, the Dryden Town Justice who isn't up for re-election this year, and says that "it is my sincere belief that Jason should join Judge Valentinelli in providing the Town of Dryden with the justice people expect and deserve." County Legislator Martha Robertson of Dryden writes to support Leifer, because he "is passionate about the law." This morning's Journal report that Dryden greenhouse RPM Ecosystems is producing trees for the Gulf Coast to replace those damaged by Hurricane Katrina and Hurricane Rita, and has a photo gallery showing more of the operations, which are on 13 next to Willow Glen Cemetery. On the opinion page, James Burlitch of Ithaca writes to endorse Stan Marcus for Town Board, and Darlene Clauson of Freeville writes to endorse Chris Clauson for Town Judge. The cover stories of this week's Dryden Courier, except for the charming picture of an elementary chorus singing before the school board, are pretty dark. One story examines the problem of a foul smell in the Dryden High School/Middle School from sewer cleaning access that can't be fixed without tearing down the building. Another examines the continuing delays on any agreement between the Town and Village of Dryden on the Cortland Road Sewer District. The Village's lawyer complains that even the much-delayed flow meters still don't include the high school, while a possible new dorm at TC3 adds pressure to lift the moratorium on development in the Town. Darlene Clauson of Freeville writes to support Chris Clauson for Town Justice. Karl Smolenski and Alita Howard of Dryden support Joe Solomon for Town Board. Robert Stolp of Ithaca supports Jason Leifer for Town Justice. Kathy Zahler of Dryden writes to support Mary Ann Sumner for Town Supervisor and David Makar for Town Board. Arjan Crimi of Dryden writes to support Mary Ann Sumner for Town Supervisor. In sports, the Dryden Purple Lions defeated the Spencer-Van Etten Panthers for the I.A.C. soccer championship title, and the Courier has a game photo and a team photo. Sophomore Patrick Street of the soccer team is an athlete of the week. In volleyball, Dryden will be competing for the I.A.C. championship Saturday. Reporter Matt Cooper's Inside Dryden column starts with the Dryden Community Cafe's Halloween barbecue (at Clark's) and tour of the new facility, at the former Charlie's Diner on the Four Corners. He mentions the five Dryden artists on the Greater Ithaca Art Trail. He writes about the Dryden Town Hall grand opening, and they have photos of architect Anton Egner with (I think) former Supervisor Clint Cotterill explaining the geothermal heating and cooling. There's also a picture of Town Board members and Zoning Officer Henry Slater cutting a ribbon and opening champagne. Then he discusses his (sometimes missing) Texas accent. This morning's Ithaca Journal reports that a short-term plan to keep the SPCA doing animal control is in the works, though whether it will keep the SPCA as animal control provider in the long run is definitely an open question. Dryden isn't mentioned specifically, but only Groton is cited as leaving the SPCA immediately. Municipalities, including Dryden, are looking for other options after the SPCA asked for a 100% rate hike, saying that their non-profit side had been subsidizing animal control for far too long. On the opinion page, Town Supervisor Steve Trumbull of Dryden endorses Cheryl Nelson for Supervisor. You, the Republican party, had a really hard time finding candidates. When you finally do have candidates, your Supervisor candidate, Cheryl Nelson, has a full-time job she'd like to keep on the west edge of Ithaca, and the new Town Hall is on the eastern edge of Dryden - a half-hour drive away. Not only that, Cheryl reports to the County Planning Commissioner, and the largest project the Town Supervisor needs to lead is, well, planning and zoning - something the Town and County tend to have very different views about. Her public works focus at her job shares territory with Town projects as well. The opposing Supervisor candidate, Mary Ann Sumner, has the time needed to focus on the job. Mary Ann and one of the Town Board candidates, David Makar, are incumbents with a reputation for getting things done. Mary Ann worked hard to solve a zoning issue that was preventing people from building windmills to power their homes. Mary Ann and David found development money the Town was letting sit around (without even collecting interest!) and moved forward with plans to use it. They finally put into action a budget line that was supposed to help community centers, creating a process for distributing that money, something the previous one-party board just couldn't figure out. All of the Democratic candidates have experience immediately relevant to the work of the board. I can see where that might be intimidating. There is, however, another option that dodges all of these obstacles: assault your opponents' patriotism. Push hardest on the issue that is just plain false, claims that your opponent wants to remove the POW/MIA flag. If you repeat a lie constantly, enough people may think it's true. Have your candidate claim the mantle of patriotism, announcing that "she considers herself patriotic and considers family values to be of the utmost importance." That last step appears in this morning's Journal article profiling Republican Cheryl Nelson and Democrat Mary Ann Sumner, the two candidates for Dryden Supervisor. "On the conflict-of-interest question, Nelson produced a letter from the Office of the U.S. Special Counsel saying her employment is not an ethical problem and that she is eligible to serve." That letter doesn't mean that there are no ethical problems with conflict of interest, only that there are no ethical problems involving federal funds. That letter says that she doesn't work for an office that receives enough federal funds for her to be ineligible to run, as specified by the Hatch Act. While she wants to focus on farmland preservation and other efforts to retain Dryden's rural character, Sumner said, "bringing more business to Dryden is a high priority." "It will happen whether or not we plan it. So, let's plan it. Let's take care to maximize the number of jobs available to Dryden residents and opportunities to buy local products from local retailers. Let's minimize environmental impact by encouraging commercial development in areas close to existing infrastructure and by promoting sustainable energy buildings and storm-water runoff controls," Sumner added. 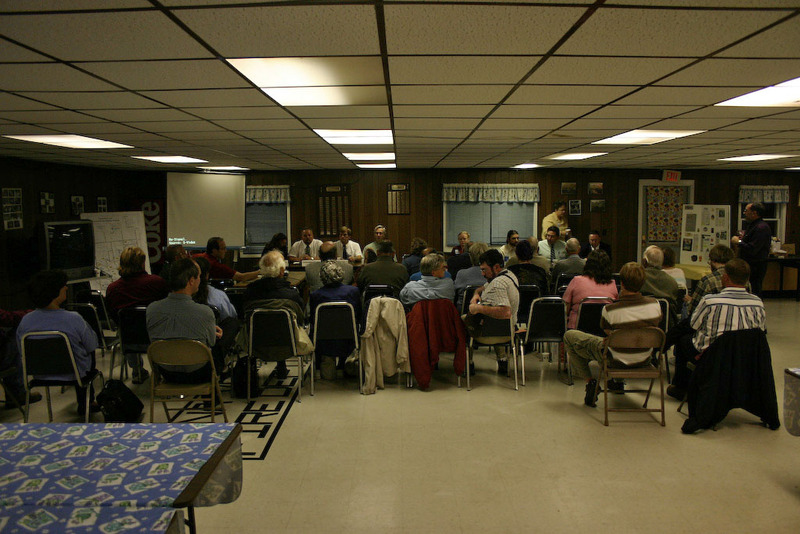 During her time as a board member, Sumner said she worked with the conservation board to draft a law allowing construction of residential solar and wind energy projects and worked with the town board to pass the law; established working committees to help Republican Steven Trumbull, the current town supervisor, delegate responsibilities among town board members; and worked "extensively" with fire departments, eliminating the need for a paid fire coordinator this year and incorporating fire department board members into the Town Board Emergency Services Committee "to give continuity to town-wide planning for emergency services." "I'm now working with the planning board, conservation board, building department and town attorney to assure that the proposed Stormwater Runoff Mitigation ordinance addresses erosion and sedimentation control to preserve our watersheds without undue burden on the town or on subdivision and building permit applicants," Sumner said. I can see why the Republicans would prefer not to run against that. There's tremendous competence there, experience that has already produced great results. Today's Journal also has a pretty good summary of the Town Board candidates' positions and background. Joseph Laquatra of Dryden writes to support Mary Ann Sumner for Supervisor. Kathy Zahler of Dryden writes to support Mary Ann Sumner for Supervisor, and David Makar and Joe Solomon for Town Board. Michael Davie of Dryden writes to encourage municipalities to support the SPCA's request for more funding for animal-control. Briefly in Tompkins notes that the W. B. Strong Fire Company of Freeville is looking for pictures, memorabilia, and stories to help celebrate its 100th birthday in April 2008. The Monitor records a DWI on Route 13 in Dryden. It's past sunset, the very end of twilight, and you've given up on ever finding your dog. Then you hear a squeaking sound, and think it might just possibly be your dog. Then a while later you hear more squeaking, and then rushing through the brush, and there's your dog, three hours late to return, covered in brambles and mud, but very glad to see you. The first part wasn't exactly happy, but the conclusion definitely brings a burst of happiness. Trumbull said he was especially worried by the possibility of financial repercussions from a DEC fine. "When I heard that, I said, 'Whoa,'" Trumbull said. "We're only 2 percent of the plant, but we're still responsible." On the opinion page, Janet Lang of Dryden writes to support Chris Clauson for Town Justice. Bill Mobbs of Ithaca writes to support Cheryl Nelson for Town Supervisor, and Joanne Sterling of Dryden writes to support Stan Marcus for Town Board. Arjan Crimi of Dryden writes to support Mary Ann Sumner for Town Supervisor.